AMSTERDAM, the Netherlands – The annual Dutch bicycle industry show reflects the current importance of the e-bike category as it has been renamed ‘National (E-)Bike Testdays’. For the first two days the event is focused on consumers. The third day (Monday 2 March, 2015) is trade only and is still called FietsVAK. The National (E-)Bike Testdays/FietsVAK will take place from 28 February to 2 March 2015 at the Expo Haarlemmermeer in Vijfhuizen, the Netherlands. 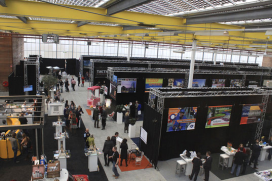 The show venue is situated some 15 kilometres west of Amsterdam while the national airport Schiphol is nearby. Bike Europe’s sister magazine Tweewieler will partner with RAI Exhibitions and provide for a full program of workshops and seminars at the trade day. These will include hands-on workshops, technical presentations but also seminars on retail and management issues. During the exclusive Tweewieler-VIP evening on Monday evening March 2nd, the Tweewieler Bike Shop of the Year winner will be announced. This election sees its 18th edition and has become an important benchmark in the professionalization of bicycle retailers in the Netherlands and Belgium. The Tweewieler-VIP event also includes the presentation of the bicycle innovation awards as well as the bike, e-bike and speed-pedelec of the year awards.